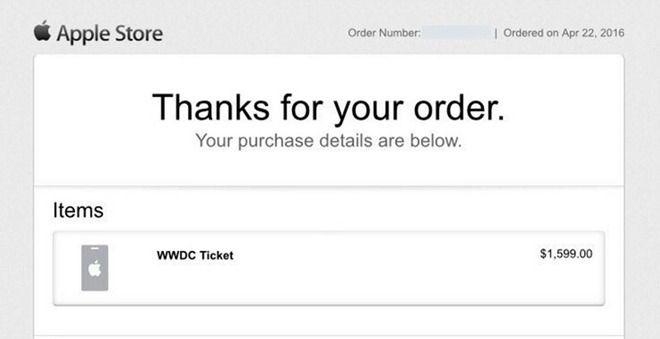 As scheduled, Apple on Friday closed ticket lottery registrations for this year's Worldwide Developers Conference and began sending out email confirmations to the lucky few selected at random to attend the event in June. WWDC 2016 confirmations began popping up online this afternoon as developers posted their virtual golden tickets to Twitter, Instagram and other social media outlets. As seen in the image above, conference passes cost the usual $1,599 per head. This year, WWDC will highlight Apple's four main operating systems, iOS, OS X, watchOS and tvOS, with attendees able to attend a series of lectures, hands-on labs and meetings with Apple engineers. "WWDC 2016 is going to be a landmark event for developers who are coding in Swift, and building apps and products for iOS, OS X, watchOS and tvOS. We can't wait for everyone to join us —in San Francisco or through the live stream," said Phil Schiller, SVP of worldwide marketing at Apple. Developers will have access to more than 1,000 Apple engineers over the five-day conference. In addition, the event will feature special guest speakers, meetings and activities, as well as the Apple Design Awards for outstanding iPhone, iPad, Apple Watch, Apple TV and Mac apps. WWDC 2016 runs from June 13 to June 17, and kicks off with a keynote event at the Bill Graham Civic Auditorium in San Francisco. Sessions and labs will be located at Moscone West, while wrap-up bash is scheduled for Thursday at Bill Graham. Select sessions will be streamed through Apple's WWDC website and official WWDC app starting with the keynote on Monday, June 13 at 10 a.m. Pacific.